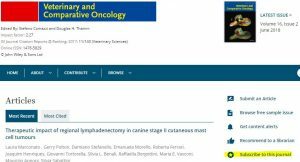 VCS members may subscribe to the Veterinary and Comparative Oncology journal at a reduced rate by visiting the journal homepage at: http://onlinelibrary.wiley.com/journal/10.1111/(ISSN)1476-5829. Once on the Wiley website, you will see a “Subscribe to this journal” on the right hand side of this page. Click on this link then follow the steps to subscribe. You will notice the rate for Veterinary Cancer Society members is currently $123.00.